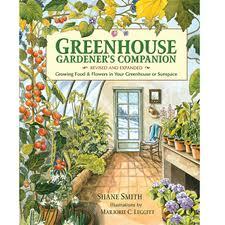 “In August of 1999, I built a small greenhouse on the edge of my parents yard. At the time I was 15 years old. Now I am 17, and the greenhouse has grown with me, along with a lot of help. I owe much thanks to my neighbors who helped me along the way – they gave me construction materials, heating materials, and anything else I needed that they had to give away. I also owe a thanks to Shane- for his book and for his help.